A warning is due here. Setting the value of the HideFromExchangeClients parameter automatically toggles the value of the HiddenFromAddressListsEnabled as well, so keep that in mind. This goes for both enabling and disabling the HideFromExchangeClients setting! You can still toggle the HiddenFromAddressListsEnabled attribute individually, although I have no information as to whether having different values for those two parameters is a supported configuration or not. Which brings us to another topic – support for this feature in the Outlook and OWA clients. Even after waiting few days, no apparent changes were observed in the list of team-related Groups displayed in either of the clients, so it seems like the relevant code changes are yet to be pushed. As the feature is still “under development”, this is not a surprise, but it’s again something to keep in mind. I will update the article once the changes are rolled out and will also try to include a matrix of the desired/possible combinations of the two parameters discussed above. Lastly, it’s worth reminding that Exchange is just one of the workloads that display a list of Teams/Groups. While this feature is a good start, I do hope Microsoft will address the numerous examples of feedback from customers and MVPs in regards to the junk created by Groups across the service. Some go as far as campaigning for individual toggles for each Group component (Mailbox, OneDrive store, Planner, Team, etc), which is unlikely to happen unless Microsoft revamps the Groups model entirely. But as more and more Groups appear in our directories, it’s clear that some improvements are needed, and fast. UPDATE: Both Outlook an OWA now correctly respect this setting. 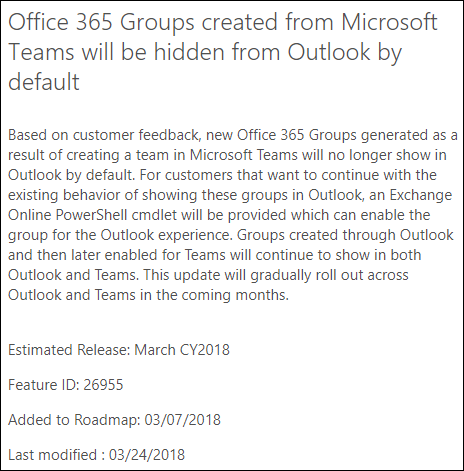 Any Groups for which HideFromExchangeClients is set to True will not be visible on the left nav menu, however you can still access them on demand (use Browse Groups in Outlook or the full path to a Group in OWA). It has been available for a while, but it’s now renamed to HiddenFromExchangeClientsEnabled. I’ve updated the article accordingly. after setting it to false? This gives the user the option to add “NiceGroup” in OWA client just fine, but as soon as the user refreshes the browser, the group is gone and user has to add the group again. Bug ? Feature? You can modify the set command to specify individual mailboxes. The command in the author’s article refers to the object being visible in outlook which is normally desireable (i.e. does not need to be changed).